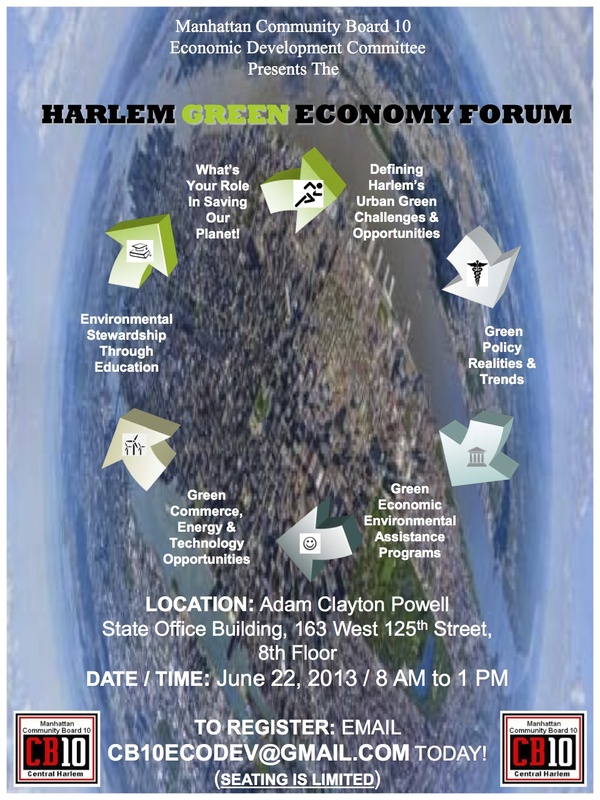 HarlemGal Inc received notice this morning that Manhattan Community Board 10 Economic Development Committee will be hosting a Harlem “Green” Economy Forum on Saturday, June 22, where representatives from local businesses, government agencies, educational institutions, residents of Harlem, and other stakeholders will have a discussion about the current and future challenges and opportunities for Harlem to participate in the “Green” Economy. The forum will take place on the eighth floor of the Adam Clayton Powell Jr. State Office Building from 8:00 AM to 1:00 PM, starting with a “Meet and Greet” with refreshments on the third floor. 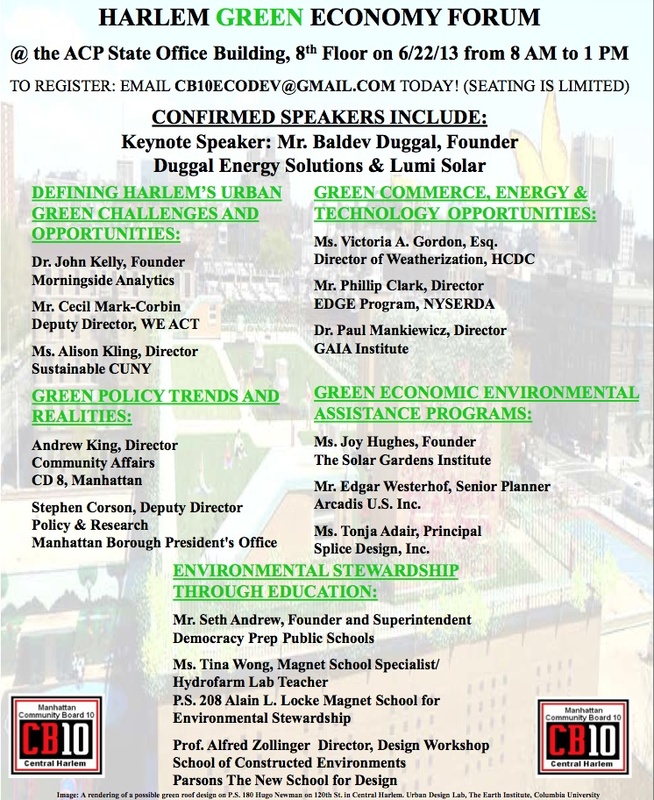 The purpose of this forum is to raise the awareness for the residents of Harlem, as well as the general public, about the necessity of further developing a “Green” economy now and in the future. Due to limited seating, individuals should RSVP by email to CB10ECODEV@GMAIL.COM as soon as possible. MillionTreesNYC will be giving a tree care workshop for the Harlem community on April 6th at Casa Frela Gallery, 47 West 119th Street, 12:00 pm to 2:00 pm. The workshop will run 2 hours and consist of two parts. The first part will be 30-40 minutes and will take place in the gallery, covering the importance of trees, tree care, and the reasons behind Million Trees NYC’s mission to plant a million more trees throughout the five boroughs. Part 2 of the workshop will be hands-on, where attendees will go outside and actively steward the two new trees on 119th Street — and beyond, time-permitting. At the end of the workshop if attendees pledge to care for a new tree in their neighborhood, Million Trees NYC will give them a free toolkit (collapsible watering bucket, trowel, weeder tool, and cultivator) and a tree care manual with step by step guide to caring for their tree. 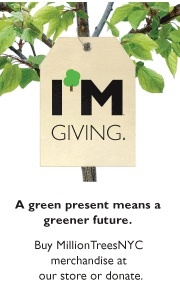 To learn more about MillionTreesNYC, visit their website. Only in New York City do parents have to start thinking about the admission process for school while their child is still in utero. And it’s not even college admissions that they have to think about first. It is kindergarten and whether that primary step toward education should be public or private. This is the reality for NYC parents and if you’re approaching this part of parenting, to do private or public kindergarten for your kid, and live in Harlem, you may want to consider attending this event. On August 13th at 6:30 pm, Let’s Talk Schools will be hosting a panel discussion in Harlem at Ephesus Church, located at 110 W 123rd Street (Corner of Lenox Avenue), on the NYC private school kindergarten admission process. 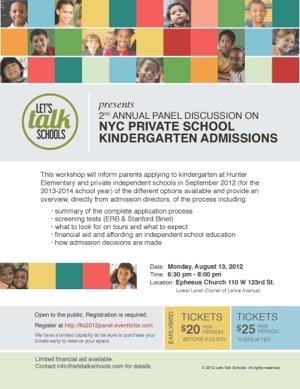 The workshop will inform parents about applying to kindergarten at Hunter Elementary School on East 94th Street and private independent schools in September 2012 for the 2013-2014 school year. The workshop will discuss the different options available and provide an overview, directly from admission directors, about the process; including summary of the complete application process, screening tests (ERB & Stanford Binet), what to look for on tours and what to expect, financial aid and affording an independent school education and how admission decisions are made. If you are interested in attending, the cost is $20 before August 9 and $25 from August 10-13. Registration is required to attend and space is limited. Click here to register.